Delightful Pastries is an egg-xpert on how to make delicious eggs, not matter which way you like them. Stop by June 3 to try any of their tantalizing egg options. If you wake up and are eager for your egg fix, head to the Delightful Pastries Café as quickly as possible. Make sure to try the Bacon, Bacon Yum ($9.95), with two eggs scrambled with ham, two strips of bacon and one slice of extra, extra thick cut bacon or either the British Mob Movie ($9.95) made with Pan-fried potato, tomato braised beans w/ mixed vegetable, sunny side up eggs, extra-thick-cut-bacon, blood sausage or the Eggs Benedict ($9.95) with Polish ham, homemade everything bun, Hollandaise sauce w/ vodka, poached eggs. 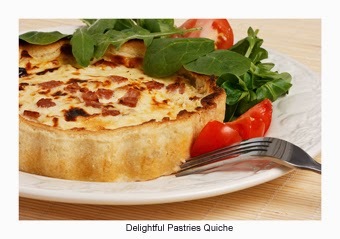 Delightful Pastries also offers egg-xcellent two egg omelets ($9.95-10.95) served with vegetables and cheese. If you missed your egg protein fix in the morning or simply crave more eggs for lunch, then Delightful Pastries has you covered. Try their Breakfast Sandwich ($6.95) with bacon, ham, scrambled eggs and cheddar or add an egg to any of their fresh sandwiches or a slice of Quiche ($5.75). Whatever you do, make sure not to let June 3 slip by without enjoying an enticing egg dish from Delightful Pastries. Breakfast and Lunch items are all available at the Wells Street location and Chicago French Market: Old Town at 1710 N. Wells St., (312) 255-0724; and Chicago French Market at 131 N. Clinton, (312) 234-9644. Visit http://www.delightfulpastries.com for more information.